The demographers agreed: At some point in 2014, Latinos would pass whites as the largest ethnic group in California. Determining when exactly that milestone would occur was more of a tricky question. Counting people isn't like counting movie ticket receipts. The official confirmation had to wait until new population figures were released by the Census Bureau this summer. The new tally, released in late June, shows that as of July 1, 2014, about 14.99 million Latinos live in California, edging out the 14.92 million whites in the state. The shift shouldn't come as a surprise. State demographers had previously expected the change to occur sometime in 2013, but slow population growth pushed back projections. In January 2014, the state Department of Finance estimated the shift would take place at some point in March. Either way, the moment has officially arrived. "This is sort of the official statistical recognition of something that has been underway for almost an entire generation," said Roberto Suro, director of the Tomás Rivera Policy Institute at USC. California is now the first large state and the third overall — after Hawaii and New Mexico — without a white plurality, according to state officials. The country's Latino population is now 55.4 million. California and Los Angeles County have the largest Latino populations of any state or county in the nation, according to the new figures. The demographic shift has been a long time coming. In 1970, the 2.4 million Latinos in California accounted for 12% of the population, while the 15.5 million whites in the state made up more than three-quarters of residents, according to state figures. By 1990, the Latino population jumped to 7.7 million, or about 25% of the state's population. The Latino population is relatively young, with a median age of about 29, while the aging white population has a median age of 45. State demographers project Latinos will account for about 49% of Californians by 2060. "It is going to accelerate," Suro said. "This is really the beginning of a new phase that will play out over another generation." A young Latino workforce helps the economy by backfilling retiring baby boomers, said John Malson, the chief demographer for the state finance department. The continued influx and growth of Latinos in the United States is not being fueled exclusively by immigration but by second- and third-generation immigrants who are settling down and starting families, said Marcelo Suárez-Orozco, a professor and dean of education at UCLA's Graduate School of Education and Information Studies. California is a harbinger of the national rise in Latinos. 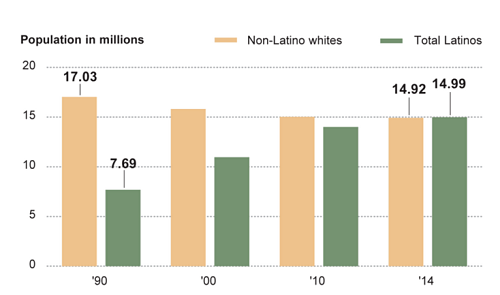 The nation's Latino population has grown 57% since 2000, when Latinos numbered 35.3 million. Latinos accounted for most of the nation's growth — 56% — from 2000 to 2010, according to the Pew Research Center. "Where L.A. goes is where the rest of the state goes and where the rest of the country goes," he said. "We announce, demographically speaking, the future for the rest of the country."